The Israeli solar power firm 3G Solar will move on grid as part of a new ownership strategy, according to PlasticEletronics.com. 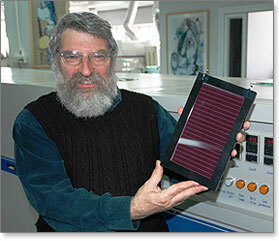 What sets 3G Solar apart from most other photovoltaic solar companies is its unique technology based on the Dye Solar cell, invented in 1988 by Professor Michael Graetzel of Lausanne Polytechnique in Switzerland. Today Professor Graetzel is active in 3G solar, whose so called “Graetzel” cells are based on a layer of nano-sized titanium dioxide particles impregnated with dye. DSC technology can best be described as ‘artificial photosynthesis’ using an electrolyte, a layer of titania (a pigment used in white paint) and ruthenium dye sandwiched between two substrates, at least one of which is transparent. Light striking the dye excites electrons, which are absorbed by the titania to become electric current. When the dye absorbs a photon, the resultant excitation injects electrons into the titanium oxide, which transports them to the negative electrode. They also claim that one of the advantages of dye solar cell is that it will offer low cost solar power with little capital imput or technical expertise by the manufacturer. The three year R&D period will serve as an indicator of how far away the DSC technology is from large scale commercial use. So far one of the few products that have reached the market is a backpack by the Welsh company G24 Innovation that lets is carrier load electrical batteries using a dye solar cell patch on the back of the backpack. One of the main problems with the dye solar cell technology is that it achieves only around 7% efficiency in their cells, which is lower than standard photovoltaic technology. On the other hand, it does not use silicone making it cheaper to produce and buy, hence the previous target of off-grid communities in the developing world. Previous investors in 3G Solar include the Quercus Trust, US based 21Ventures (we’ve featured here) and the Israeli Chief Scientists Office.